Originally published November 30, 2009. Poor Kenny. 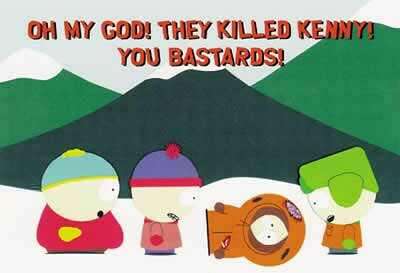 For those who have never seen South Park, or who have been living in a cave on Mars with their eyes closed and their fingers in their ears for the last twelve years, Kenny McCormick is the unfortunate member of the South Park gang who, in nearly every episode in the first five seasons, dies a terrible death. So, as I was saying, poor Kenny. Kenny is a really unlucky little kid. Kenny dies in just about every way imaginable. He is electrocuted, crushed by a tree, torn apart by an angry mob, gored by a bull, eaten by fish…and so on and so on. If there is a chance, however small, that someone could be injured while participating in any activity, Kenny will beat the odds and become the fatal statistic. I’m glad I’m not as unlucky as Kenny, and I hope that you’re not either. If you are, there’s not much that can be done about it. But if you’re a little more average, it pays to take some precautions while engaged in activities that have a higher risk of injury than sitting around on your sofa watching South Park. First Aid Kits Are Non-Negotiable. I’ve said this before, and I’ll say it again. Bring a first aid kit when you hike and camp. Bring it when you’re solo, bring it when you’re in a group, just bring it. Bring it even when you think that the hike should be a piece of cake, especially if you’ve never done it before and don’t know from personal experience how easy it will be. After all, we know what can happen when you set out on what you think is a “simple” hike in unknown territory. I don’t want to hear any excuses out of you. A while ago, I discussed what should go into a first-aid kit in some detail. You don’t have to put much work into getting one together, however, because ready-made kits are available for your (inexpensive) purchase. First aid kits come in all sizes (mine weighs half a pound) and so the minor extra weight is worth the vast benefits of carrying one. You should also learn how to use your first aid kit. Having one won’t help in an emergency if you’re sitting there trying to figure out what a lancet is or how to operate your snake-bite suction device. Read the instructions in advance. Buy a first aid manual and study it (they make compact ones that you can bring with you, and some ready-made kits actually come with them). You can even take a first aid course. At the end of the day, a first aid kit, and knowledge of how to use it, can help you avoid the fate that always, always, seemed to befall poor Kenny. Those bastards. The answer: Sometimes. But not as often as you’d think. Now, I should say up front that whether or not I get bored does not necessarily have a bearing on whether you will be bored. I was always one of those kids (and am now one of those adults) happy with a book and my own company. That’s not to say I don’t enjoy being social, interacting with crowds, and being in the company of others. I do. But I also like having time to myself. So I am probably less likely to get bored than someone who needs other people around all the time. Still, fear of being bored shouldn’t stop you from giving the solo thing a try. You might be surprised at how interesting you are to yourself. Or how creative you can be when left alone for a while. In National Parks, there are often tours and guided hikes that you can join — even informally. I’ve been known to just tack myself on to the back of a tour (which, when I start asking questions, makes other people look at each other and think “who the heck is that?”) There are likely to even be other solo travelers you can link up with for a hike, dinner, maybe even a portion of your trip. Don’t be afraid to be friendly and make friends (of course, using your head and trusting your instincts all the while). Read. If you’re like me, there are stacks of books you’ve been meaning to read, but you don’t take the time to do so. I read snatches of books on the subway, but truly taking the time to lose oneself in a book is rare in this age of constant connection and communication. When you’re packing for a long hike, go ahead. Bring a book. Read for a little while during your lunch break reward. Read with your headlamp in your tent at night (though, from experience, I’ll caution you not to read a fast-paced cop/murder thriller while camping alone…you won’t get any sleep that night). Read under a tree on the banks of the Mississippi. Read in a bar. Side note: Oddly, I’ve had more people approach me while I’m reading than not. Perhaps because it gives them an opening line. I don’t know, but I’ve met more people over a book than while sitting and staring at a television or noodling on my phone. So maybe reading can accomplish two things! Listen to music. So you’re on a road trip. You’re by yourself. You’re cruising along on a big empty road out west. Where better to indulge your love of singing loudly and badly? No one is around to hear you — or even see you (and if you’ve ever stopped mid-song in heavy traffic to see the guy in the car next to you pointing and laughing, you’ll know why that’s important). Go ahead, put on your guilty pleasure music, that stuff you don’t want anyone to know you want to listen to. Who’s judging? Books on tape. So this is a bit of an anachronism. No one listens to books on tape anymore, or even books on CD. It’s audiobooks, thank you very much. Whatever you call them, the end result is that someone is reading a book to you. If you aren’t sure you’d like this (for example, I hate being read to), pick a book you know you’ll like, or go with a recommendation from a trusted friend. The key to a good audiobook is a) being interested in the book; and b) having it read well. This second one is probably the most important, and now with iTunes and other online purchasing of audiobooks available, you can listen to snippets and see if you can stand the voice. Podcasts. Do I really have to explain this one? There are bazillions of them. Surely there’s one out there that will hold your attention. Write. If you keep a journal, you should have plenty to say while traveling. If you write other things, like poetry or fiction, use the time to compose your epic. Okay, so I’m a writer. I am not, however, a journal-er. I have never been able to keep a journal, something that has bothered me my entire life. When I travel, however, it’s so important to me to record as much as possible so that I can use it in later writings (hey, like this!). Alice Steinbach, in her lovely travel memoir Without Reservations, describes an ingenious method of keeping travel notes: send yourself postcards. Yes, you heard me. Do it every day. Find a postcard you like at a place you stop, and that night, write out a sentence or two. Something that made an impression, or something that someone said, or something you saw. If that feels too weird for you, pick someone back home and send them a postcard every day. The nice side benefit of this is that it also focuses your memory and forces you to reflect on what you have seen and done. Learn something. No, I don’t mean study physics (unless you really want to). There are plenty of things to know, and one of the fun things about solo camping, hiking and road-tripping is that you can choose precisely which things you want to know more about. As noted above, the National Parks often have guided hikes and tours, ranger demonstrations, and even museums. If there’s nothing scheduled, chat up a ranger — they are usually glad to share their knowledge and expertise. Go to a museum (even a non-National Park museum!) and wander at your own pace. Grab the audio tour. Find an old-timer sitting on a porch and ask him about his childhood. Learn something. And then, when you get back, you can impress your mom with stories. You know what? Sometimes you’ll be bored. At least you’ll be bored while doing something interesting on the grand scale, rather than just sitting around your house. And then you’ll find something else to do, and you won’t be bored anymore. What about you? How do you stave off the boredom while traveling alone?